Charlotte Mueller’s PhD research focuses mainly on the African nations of Ethiopia, Sierra Leone and Somalia — and she has travelled to all these countries over the last three years to collect data. Yet, as a European researching African issues, she is acutely aware of various Eurocentric assumptions, and that African development is still frequently discussed from an external, third person perspective. In this post, Charlotte argues that the 2030 Agenda will only succeed across Africa if it is shaped and informed by local approaches. 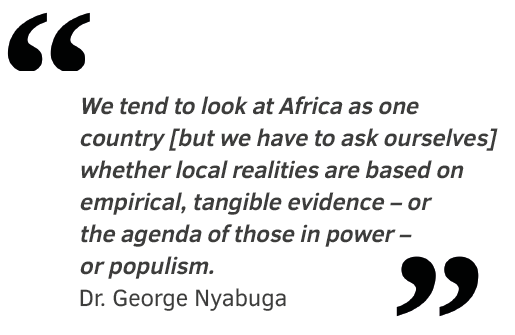 There are many ways to mitigate one’s own bias in doing research on Africa. One way is to attend events that enable interactive exchange between African and Non-African scholars and practitioners. 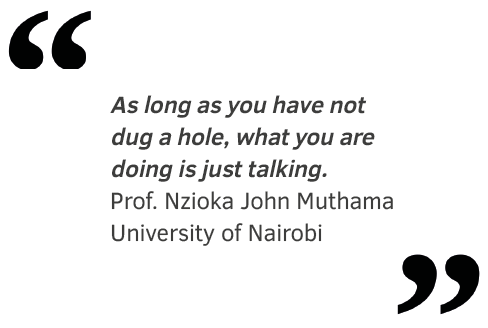 In November 2018, Maastricht University offered me the opportunity to attend a research impact workshop at the University of Nairobi, Kenya, organised by the Global Africa Group (GAG). As one of the two global groups within the World Universities Network (WUN), the GAG unites 13 universities from Australia, Ghana, Kenya, South Africa, the Netherlands and the UK, among others. The workshop gathered researchers from seven of the 13 GAG member universities as well as regional practitioners. While the workshop focused mainly on the implementation of the Sustainable Development Goals (SDGs) in East Africa and the translation of collaborative research into policy impact, I was able to gain additional insights throughout the workshop, which in turn demonstrated the critical importance of events of this kind. Workshop participants highlighted the persisting negative stereotyping of Africa and Africans, caused by predominantly negative media coverage of Africa. 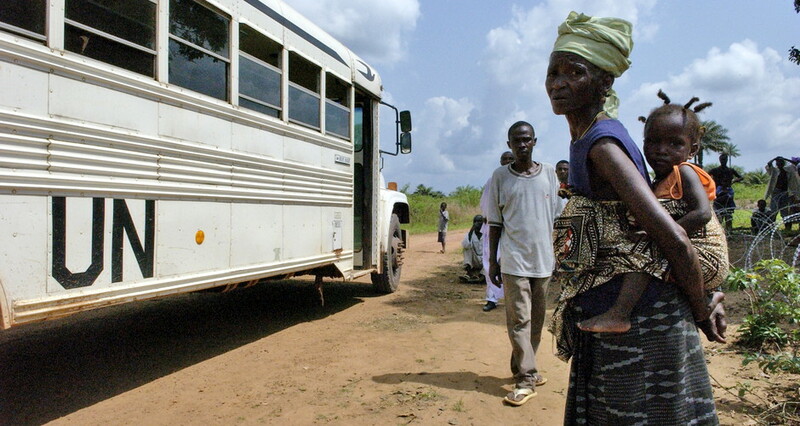 While it should in no way be ignored that issues such as corruption, poverty, inequality or violence remain important challenges in several African countries, there was a consensus that there is a need to move away from these negative stereotypes towards more balanced representations and new narratives which also highlight positive advancements and opportunities and which are produced locally instead of imposed from outside. This is an idea that has been promoted by personalities such as Chimamanda Adichie in her talk ‘The danger of a single story’ several years ago but also more recently on social media through hashtags such as #TheAfricaTheMediaNeverShowsYou. Another take away message from the workshop is that the African continent is often considered as one country, a view that ignores major differences between nations. With over 50 countries, there is a great diversity with regards to languages and culture, while countries differ greatly in levels of socio-economic development and political stability. This is an important aspect to take into account when talking about the implementation of the SDGs. For example, in times of humanitarian crises and in conflict zones, this is challenging, if not impossible. Interventions focus on humanitarian assistance first. Getting accurate and up-to-date information is much more challenging in such contexts — in Somalia, for example. The workshop also clearly showed that implementing the SDGs in East Africa does not come without challenges. One major challenge is a lack of accurate data, for example on education quality, a lack of disaggregated data, and the additional difficulty that existing data cannot be verified. Yet, data is crucial to inform the work of policymakers and practitioners in the region. At the same time, Africa as a whole has fewer than 170 researchers per million inhabitants (compared to almost 3,000 per million in Europe) and the continent accounts for just 1.3 per cent of global investment in research and development (R&D) — though spending on R&D is on the rise particularly in many East African countries. During the workshop it was concluded that a lack of research equipment in African universities makes it difficult to meet basic requirements for research funding, and the fact that most research funding comes from the Global North creates a certain dependency. Also, especially PhD candidates in a country such as Kenya are disadvantaged, by, for example, a lack of access to many high-ranked journals or a lack of financial support to attend international conferences or for exchange visits. Drawing on what I outlined above on the need for realistic narratives and country-specific approaches, it is therefore important to foster and strengthen research by African researchers in Africa. 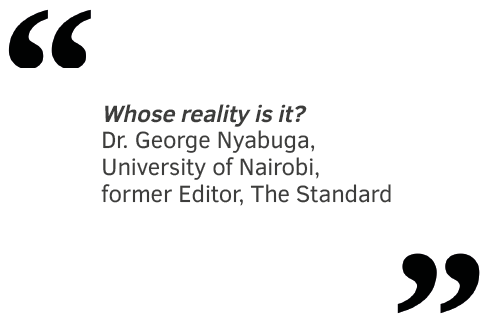 In line with this, the GAG aims to develop regional research hubs anchored to its member universities across the continent, such as an East Africa hub in Nairobi. On a bigger scale, research and development budgets have grown significantly in many East African countries, and there have been attempts to develop coherent scientific strategies across Africa and new initiatives to support the development of a research culture in Africa. Finally, I see the need for continued cooperation and interaction. I was able to attend the workshop thanks to Maastricht University, which has long been a member of the GAG. PhD candidates and early career researchers in particular can benefit from long-term networks for cooperation and exchange to advance their research as well as to support their professional development. I also see a need for action resulting from this workshop. One concern raised was that the SDGs are so broad that there is a risk of ‘getting lost’. A result of the Inaugural Strategic Research Workshop in Ghana was a joint book project. The aim of this year’s workshop was to have our discussion translated into policy briefs, media outputs, and grant applications. I hope to see future events, exchanges and collaborations arising from this workshop. 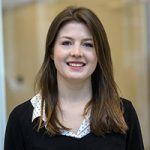 Charlotte Mueller is a PhD Fellow in the Migration and Development research group at UNU-MERIT. Her PhD explores diaspora knowledge transfer and factors that enable and inhibit knowledge transfer in the case of a temporary return programme. She works on the impact evaluation of the IOM Netherlands project 'Connecting Diaspora for Development; (CD4D), for which she has repeatedly collected data in Afghanistan, Ethiopia, Ghana, Sierra Leone and Somalia. She holds an MSc of Public Policy and Human Development with a specialisation in Migration Studies from UM / UNU.